This article shows several ways to reset all parameters to their default values. Mission Planner has a dedicated Reset to Default button if the “Advanced Layout” feature is enabled. 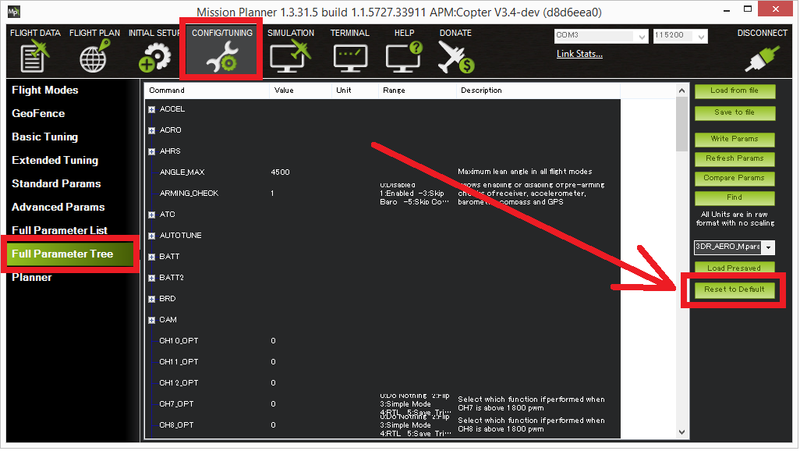 Connect the flight controller to Mission Planner, and on the Config/Tuning | Full Parameter List or Full Parameter Tree page push the Reset to Default button. The flight controller will automatically reboot, setting all parameters back to their default values. On any Ground Control Station (that can write parameters) you can reset parameters by setting the SYSID_SW_MREV parameter to zero. After writing the parameter, reboot the board. This method is not recommended because it’s unnecessarily time consuming. Upload the firmware for a completely different vehicle type (I.e. if you were using Copter, now upload the Rover firmware). Reboot the board and let it sit for 30 seconds to clear the EEPROM. Then upload the original firmware (i.e. Copter) to the flight controller.